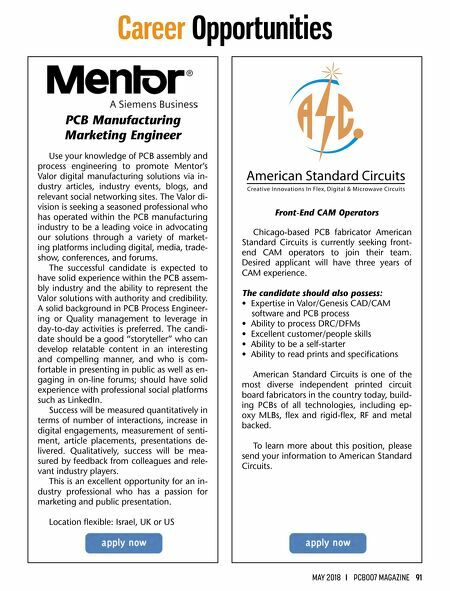 MAY 2018 I PCB007 MAGAZINE 91 Career Opportunities PCB Manufacturing Marketing Engineer Use your knowledge of PCB assembly and process engineering to promote Mentor's Valor digital manufacturing solutions via in- dustry articles, industry events, blogs, and relevant social networking sites. The Valor di- vision is seeking a seasoned professional who has operated within the PCB manufacturing industry to be a leading voice in advocating our solutions through a variety of market- ing platforms including digital, media, trade- show, conferences, and forums. The successful candidate is expected to have solid experience within the PCB assem- bly industry and the ability to represent the Valor solutions with authority and credibility. A solid background in PCB Process Engineer- ing or Quality management to leverage in day-to-day activities is preferred. The candi- date should be a good "storyteller" who can develop relatable content in an interesting and compelling manner, and who is com- fortable in presenting in public as well as en- gaging in on-line forums; should have solid experience with professional social platforms such as LinkedIn. Success will be measured quantitatively in terms of number of interactions, increase in digital engagements, measurement of senti- ment, article placements, presentations de- livered. Qualitatively, success will be mea- sured by feedback from colleagues and rele- vant industry players. This is an excellent opportunity for an in- dustry professional who has a passion for marketing and public presentation. Location flexible: Israel, UK or US Front-End CAM Operators Chicago-based PCB fabricator American Standard Circuits is currently seeking front- end CAM operators to join their team. Desired applicant will have three years of CAM experience. The candidate should also possess: • Expertise in Valor/Genesis CAD/CAM software and PCB process • Ability to process DRC/DFMs • Excellent customer/people skills • Ability to be a self-starter • Ability to read prints and specifications American Standard Circuits is one of the most diverse independent printed circuit board fabricators in the country today, build- ing PCBs of all technologies, including ep- oxy MLBs, flex and rigid-flex, RF and metal backed. 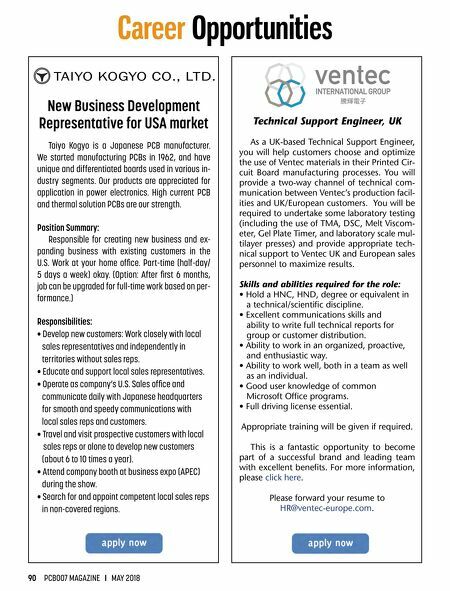 To learn more about this position, please send your information to American Standard Circuits.